Here the disciples are reclining at table, enjoying the Passover meal. Christ has just told them “But I say unto you, I will not drink henceforth of this fruit of the vine, until that day when I drink it new with you in my Father's kingdom” Matthew 26:29 KJV. Jesus is gazing out the window, looking to the Heavenly Jerusalem, a beautiful castle church. Yet something supernatural is taking place, the resurrected glorified Christ is coming in as beams of light to embrace, kiss, and feed one of the disciples with His own body and blood. If you look closely, you will see that the foretaste of the feast to come is present. The disciple receiving Christ personally is peering through the wound in His hand, and gazing upon the sacred food. In the same way, may you see yourself as the beloved in the Lord in this holy meal. Christ’s wound is silver leaf, and it reflects outward. Our own reflection shows up in the wounds of Christ, where we are safe inside. The background is made of gold, silver, and copper leaf, representing the House of Living Stones that all Christians make up. The stones are sealed together with the blood of Jesus. Mary is weeping at the tomb, searching for Christ, whom she came to anoint. She has a sinking feeling in her stomach, thinking Jesus is gone forever. She does not know yet the empty tomb means He is alive again. Here is the moment before she sees Jesus. He is on the other side of the lilies where you stand, watching her and ready to speak and to comfort her. In Song of Solomon 6:2, the Shulamite remembers, “My beloved is gone down into his garden, to the beds of spices, to feed in the gardens, and to gather lilies” KJV. Jesus was buried in a garden, His resurrection meant to herald the coming new creation. The creation He is the firstborn of. Christ the Man of Sorrows in Isaiah, grieves over our trespasses. In this small portrait, shadows from the crown of thorns cast dark lines upon the Lord’s face. His eyes are skull-like hollows, red and swollen from weeping. Only three colors are used: black, red, and white. The black refers to our sin, red symbolizes Christ’s blood, and white represents forgiveness. Jesus offers up His life willingly without complaint for our sin. I joy to call you mine! When He was buried in the tomb, Christ died as the perfect seed to give life to many. His head is inverted beneath the soil, covered in a burial shroud. Beneath the ground with Him are hundreds of seeds, illuminated with the Gospel of peace. Painting: Oil and acrylic on canvas, 16" x 20"
Frame: Metal and acrylic, 23.75" x 28"
Vines adorn the frame of this painting, representing the intimate union the church shares with Christ through the Lord’s Supper. The branches twirl around the vine, bearing fruit, so that others may live and abide. In the center is Jesus Christ, a golden cross superimposed over his body. Layers of crosses radiate from Him; His burial cloths quiver with light. Around His head shines the rising sun, as He is being resurrected. Breath re-enters His body as He awakens inside of the tomb. In traditional imagery, the resurrected Christ floats in midair above the tomb. He is wrapped in a cocoon of floating fabric, ready to burst forth in victory over death. These burial cloths encapsulate Christ as chrysalis. 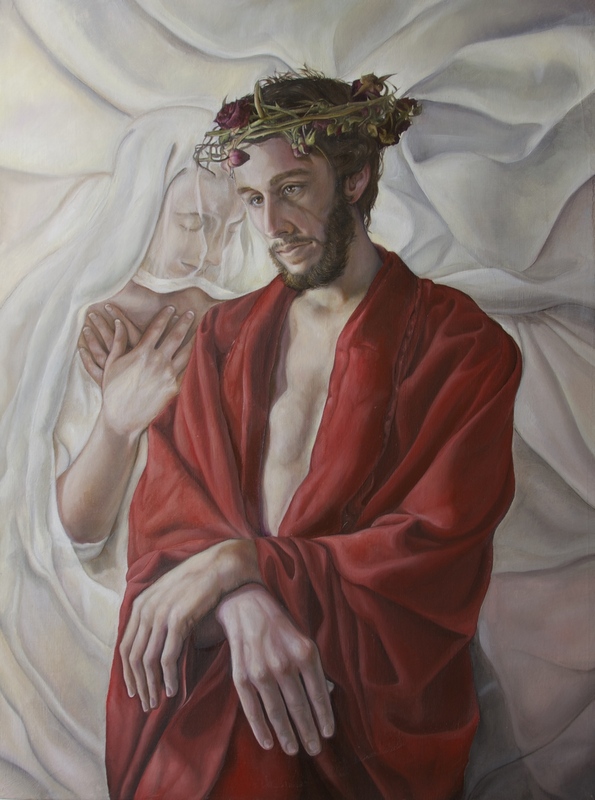 This painting is based on a combination of Old Testament and New Testament references. The garment our Lord is wearing is full of colors. God sent Noah a rainbow as a sign of His covenant to never destroy the earth by water again. 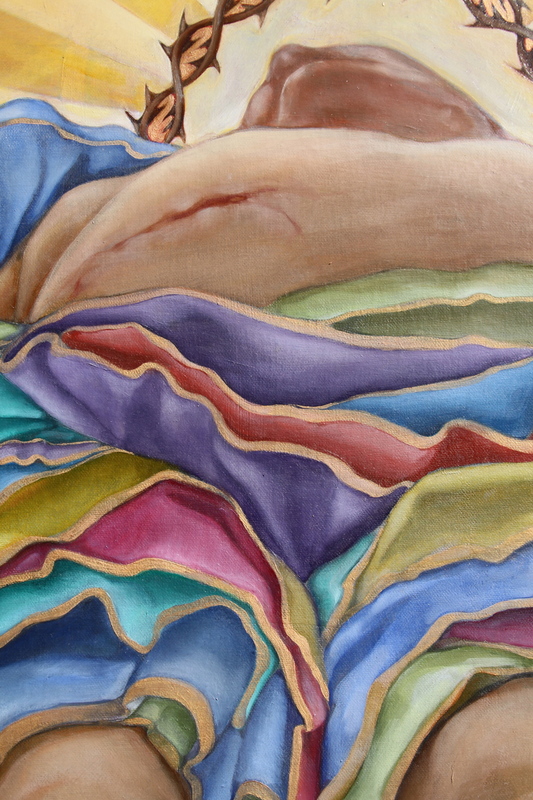 Jacob gave Joseph a coat of colors as a gift to demonstrate his favor. In traditional Christian iconography, the resurrected Christ waves a victory banner as He steps forth from the grave. In this interpretation, Christ wears the victory banner. His head is covered with a crown of thorns, transformed into a halo. Light beams project how Christ’s suffering brought good to all mankind. The view with which we see Jesus Christ is not the face, but the feet. His face, His full glory, is hidden from our eyes. Jesus descends into our human condition, fully embracing His humanity, with the feet as the lowest part of man. In centuries past, crucifixions were hung in the home as visual reminders of Christ’s sacrifice on the cross. They brought comfort to Christians who recognized that God poured out His wrath upon His son, not us. This does not free Christians from suffering, but we know that God promises to work all things for the good of those who love Him. Through the lens of the cross, suffering has an eternal purpose. It becomes an opportunity to be conformed into the image of Jesus Christ. Francisco Zurbaran, a Spanish painter during the Counter Reformation, experienced much suffering in his life. His crucifixion paintings are profoundly powerful, as he must have sought great comfort there from his griefs. This image is a small study based on his painting that hangs in the Art Institute of Chicago.